CGP Community Stories collects, preserves, and disseminates the diverse oral histories of the residents of Central New York State. A project of the Cooperstown Graduate Program (SUNY Oneonta), CGP Community Stories serves as a resource for local history researchers and a community record of significant transformations in the rural areas of New York State. We are committed to creating public programs that use oral histories to connect past and present and facilitate dialogue on critical social and environmental issues. Visitors to the website can explore themes central to the lives of the people who live and work in the agricultural heartland of the state. Key topics are: Environmental History, Family and Community Life, Farming, Tourism, Rural Healthcare, Social Justice and Activism, and Folklife. Beginning in the 1960s, students in the Cooperstown Graduate Program began collecting oral histories from residents in the central New York region. This collection of oral histories has progressively grown each year to the existing archive of over 1,800 recordings. Along with additional material, including transcripts, field notes, and photographs, the collection provides extensive documentation of Central New York's rural communities. Cooperstown students began their collecting efforts under the direction of Louis C. Jones, the founder of the Cooperstown Graduate Program, and Bruce Buckley, folklorist and director of the American Folk Culture program. Jones and Buckley provided the intellectual and practical foundations for this long-term project, encouraging students to explore the folkways of New York State and preserve in-depth narratives of ways of life that stretched back to the early nineteenth century. Their commitment to gathering and sharing the stories of many different kinds of people--especially working people--continues to provide inspiration for our ongoing oral history project. 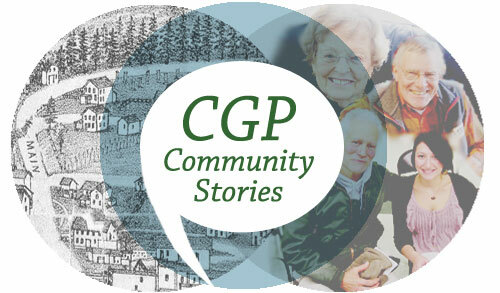 In 2008, the CGP Community Stories website launched as a means for providing easier access to this rich historical resource. The archival recordings uploaded to the website provide archival quality sound recordings of the oral history interviews, along with extensive metadata to assist researchers. In addition to maintaining and growing our digital archive, CGP Community Stories facilitates public dialogue programs that utilize oral histories to support community conversations on critical social and environmental issues.